Louisiana native Lue Svendson is a painter and a landscape architect. Lue’s work in paint and nature exist world wide in Dubai, Costa Rica and the United States. Born in 1952, Lue was influenced to think creatively from a young age. Since she was a young girl she has had a natural ability in drawing using pencil, charcoal and watercolor. She was pushed by her parents in this direction and an artistic heritage. As she got older, she moved toward her professional choice to combine her love of art and nature to become a landscape architect. Her education and work in landscape architecture put solidly in focus, by intensive exercise and discipline, design principles relating to shape, space, line, scale, color and texture. Lue enjoys working in varied styles with different materials thus keeping both she and her art fresh. While she and her husband raised three children, Lue worked as a landscape architect and has remained active in the community and church. In an average year she donates many paintings to charitable organizations, schools, churches and social organizations. With oil paints her selected medium Lue paints as often as she can creating many scenes from the local area. She paints what she knows best; the woods and the prairies of South Louisiana. Although Lue has been painting only a few years, her experience as a professional designer brings a cultured maturity to her work. The work produced since 2002 has created more than 20 shows for galleries and art events in the Lafayette and Baton Rouge, Louisiana area. 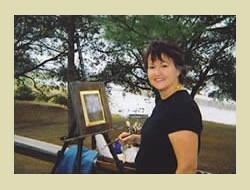 Lue has been influenced by the techniques of Sergei Bongart, George Inness and her teacher Pat Bourque of Lafayette, Louisiana. Often than her degree in landscape architecture from LSU, her art education has consisted of individual art classes and seminars. She is a member of the Lafayette Art Association.